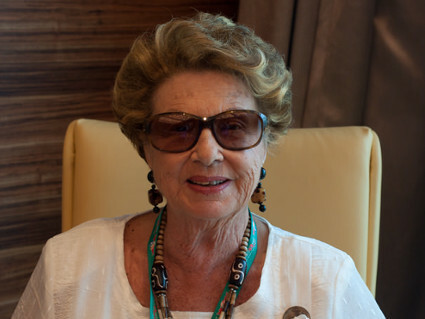 Anna Maria Torlontano Di Toro Jannucci was the leading light in the development of Women’s bridge for the Italian Bridge Federation, the World Bridge Federation and the European Bridge League. She spent her entire life in Pescara, Italy having studied Law at the University of Rome. Anna Maria developed an enormous interest in the growth and advancement of girls and in 1958 she created a school of Classic Dance, endorsed by the Ministry of Education, using teachers from the Opera in Rome and from the State Academy. The school became very successful and continues to this day. She was a member of the International Inner Wheel Club of Pescara (the association of Rotarian Wives) as International Service Organizer. She was one of only two women members of the Italian Cooking Academy, delegation of Pescara, which studied gastronomy and Italian cuisine. She was a member of the Executive Committee of the Music and Theatre Academy in Pescara. Her involvement with bridge started in earnest in 1975 when she was elected President of the Bridge Association in Pescara. In 1978 she was elected to the Board of the Italian Bridge Federation and was appointed to manage the Women’s sector and also take on the role of Captain of the Italian Women’s Team. Italy was very successful at that time, winning the Venice Cup in 1974 and finishing as runners up in 1978 and they won five European Championships between 1970 and 1977. However, there were only eight sufficiently motivated and talented players and she created a program specifically for players, both regional and national and worked to push and convince as many women as possible to participate. After only one year, she had 86 pairs in the National Women Pairs Championship, which she had organised for the first time. By 1982 there were 104 teams competing in the National Women Teams Championship. By 1998, the number of pairs competing in the Women’s Pairs had risen to 340, the number of teams to 182 and the participation in the Italia Cup, another event specifically for women was 138 teams. Her administrative skills led to her becoming the first woman to be elected to the Board of the European Bridge League in 1985. She was given the task of managing and organizing the Women Bridge Sectors in Europe, something that had not been attempted previously. She formed the European Women Committee, acting as its Chairman until her appointment as Chairman Emeritus. In 1986, she organized the first European Ladies Pairs Championship. In 1992, she was elected as a representative of the European Bridge League, to the Board of the World Bridge Federation, where she was appointed as Master of Ceremonies and Chairman of the Hospitality and Protocol Committee of the WBF. Her style of presentation made her a household name, and her introductory remarks – ‘My name is Anna Maria Torlontano, and I am your Master of Ceremonies’ became legendary. In 1995, she was nominated Vice President of the European Bridge League and in 1999 she was awarded the EBL gold medal for her services. She was appointed Chairman of the World Women’s Committee, a new Committee created by José Damiani within the World Bridge Federation. Anna Maria instigated the WBF/BBO online Women’s Bridge Festival, initially staged in April each year and because of its success a second Autumn Festival was introduced. In 2003 she was awarded the Gold Medal of the World Bridge Federation and in 2007 she was named as an Honorary Vice President of the EBL Executive Committee. Her proudest moment came when she was named as a Member of the WBF Honour Committee in 2014. When she started her work there were about 125 National Bridge Organisations and she wrote to them regularly, her aim being to establish a situation where bridge was more accessible to women. She worked tirelessly to increase the number of women bridge players, encouraging NBO’s to concentrate their efforts on participating in European and World Championships, even suggesting that some of the funds assigned to the participation of men in the Open Pairs and Teams Championships, should be allocated to the Women’s Pairs and Teams. She was certain that appointing a woman to be responsible only for Women’s Bridge in every NBO, preferably a woman who is a Member of the NBO’s Board was essential for the development of women’s bridge. She argued that a woman knows better the needs of other women, and is far better able to understand their mentality and to help them change, little by little, the philosophy of life that has been present for many generations particularly in the less developed countries. Anna Maria was a major force in the Bridge World. We will not see her like again.